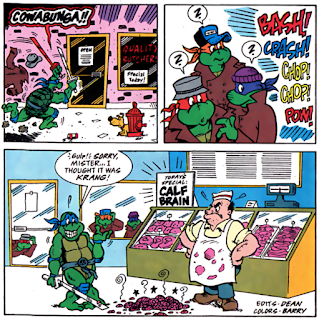 The Turtles are crossing the street when Leonardo spies danger behind the window of a nearby butcher shop. Leo springs into action, attacking the calf's brains with his sword, having mistaken them for Krang. Leo is then left to nervously explain himself to an irate butcher. 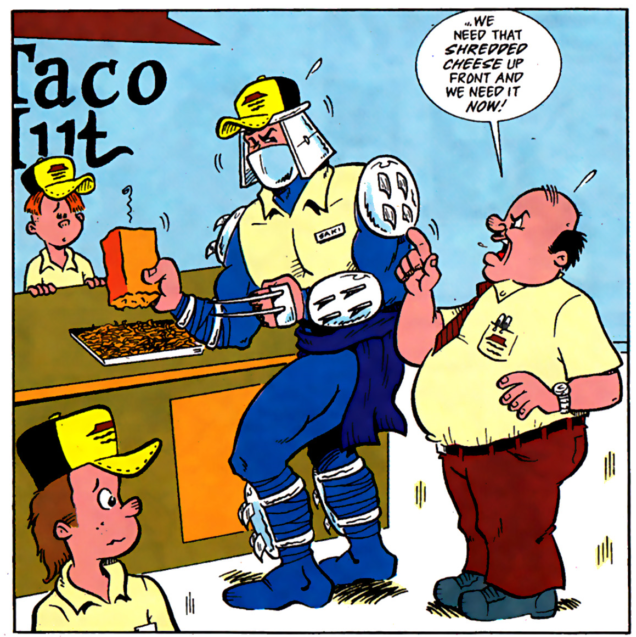 "What the Shredder did for a Living Before he was an Arch-Villain"
Before he was the Shredder, Oroku Saki was an employee of the Taco Hut, using his armor to shred cheese for an impatient shift manager. As the Turtles invade the Technodrome, Krang taunts them from a closed circuit camera/TV system, boasting about how he'll soon be Emperor of Earth. Michelangelo mocks him, telling him he has a screw loose. Pointing to a prison cell containing the Mighty Mutanimals, Krang informs Mikey that not only does he have a Screwloose, but he also has a Wingnut, a Man Ray and many more! 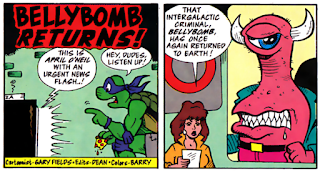 Watching TV, Donatello's program is interrupted by an emergency bulletin from April. She warns the city that the intergalactic criminal known as Bellybomb has returned to Earth. Don calls the Turtles to action, but Splinter warns him that he must be prepared before going into battle. Donatello then reveals his ultimate weapon against Bellybomb: A high pressure hose and a tank full of mouthwash. 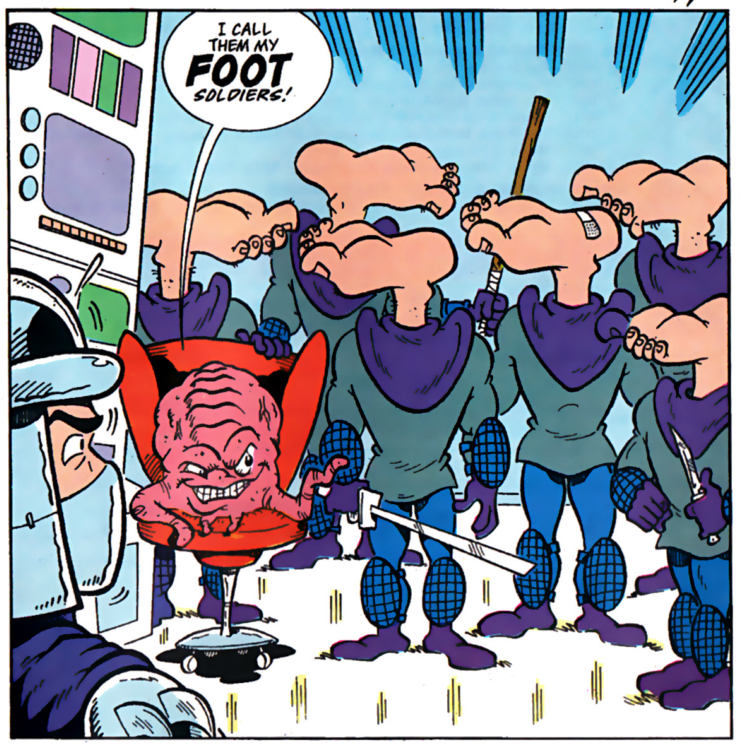 In the Technodrome, Krang calls Shredder in to introduce him to his latest creations: The Foot Soldiers! ...Ninja with gigantic feet for heads. *These one-page gag stories were used as bonus content in the fifth volume of the TMNT Classics Digest series and occasionally as filler in the TMNT Adventures ongoing series. 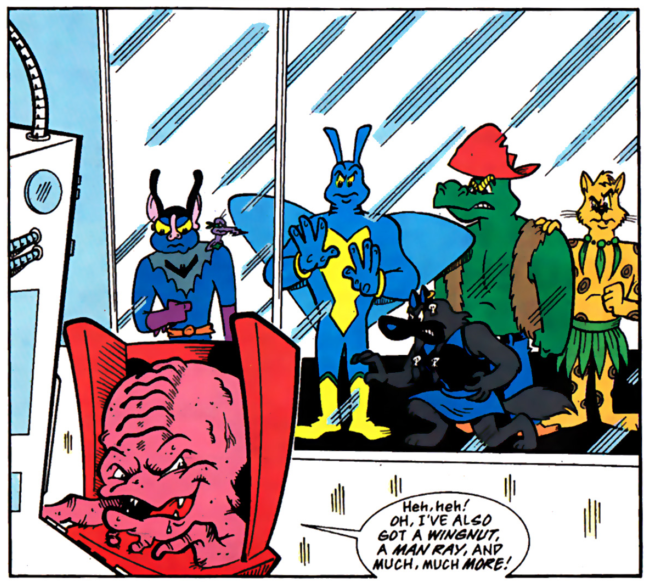 *"Meanwhile in Dimension X" was reprinted in TMNT Adventures #45 and "What the Shredder did for a Living..." was reprinted in TMNT Adventures #48. Yeah, these things were pretty corny and bad, almost always relying on a lame pun or a droll visual. But I dunno, I kinda liked them for what they were. I think they worked better as an extra little bonus in the back of TMNT Adventures issues rather than bunched together in a TMNT Classics Digest volume. A little of this type of humor goes a long way and you get sick of them after two or more strips. @Mark: While I agree on the short summary given, I had expected a mention of Gary Fields being responsible for the lettering in the TMNT Adventures comics, too be frank. I wonder why Fields was given the task of writing and drawing the gag pages, which were mostly exclusive to the US print runs of TMNT Adventures. His style is an obvious mix of the pages drawn by Ken Mitchroney, Michael Dooney and Jim Lawson. So, by the time these stories were printed in the mid-90s, they were standing out quite a bit from the actual content of the Archie books, as drawn by Chris Allan and sometimes Brian Thomas. I wish they did bring Bellybomb back for another story. Shame he was mostly a one-shot character who was forgotten about after issue 25. Bellybomb recently showed up in the Nick cartoon. The title should have been "Gary's Groaners".